and click "Next" to proceed. Did you already register? Member Login. 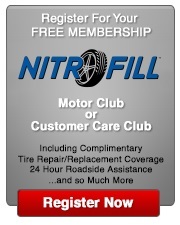 Purchase a vehicle from a participating NitroFill dealer and adhere to our tire maintenance program and you may qualify for almost $700. in cash Rewards towards the purchase of your next set of new tires. Qualifying NitroFill purchases now also include a tree planted in your honor. To dedicate your tree, please register your NitroFill purchase here. To Learn More about the NitroFill Plant-a-Tree Program, click here. *Complete details are provided upon customer registration as benefits may vary. Benefits cover qualifying cars, trucks, SUV's, motorcycles, RV's, trailers, ATV's, bicycles, lawn and garden and specialty tires. Tire repair benefits do not apply to motorcycles, ATV's, bicycles or Specialty Tires.